In-car satellite navigation systems – often shortened to ‘sat nav’ – have come a long way in three decades. But their development stretches back to 1909, when an engineer named J.W.Jones invented the Jones Live-Map in-car navigation system. As reported by The New Yorker, the Live-Map was connected to a car’s odometer and consisted of a glass-enclosed dial, on which you could place a disk representing a particular trip. The disk had mileage numbers around the edge, along with driving directions printed on the face. As you made your way along the road, the disk would rotate, telling you where you needed to go. In truth, it wasn’t all that good, but it laid the foundations for future development. That said, the pace of development was surprisingly slow. The motoring world had to wait until 1966 for the next chapter in the history of the sat nav, when General Motors engineers designed a system called DAIR, or Driver Aid, Information and Routing. DAIR relied on punch cards to provide information for basic turn-by-turn directions. The driver could ‘record’ a route with turns being represented as different gaps in the card’s surface. GM proposed a series of radio relay stations and magnetic sensors buried in roads, communicating everything from directions to road conditions and accident reports. In many ways, DAIR was an early, albeit primitive version of the modern OnStar system, found in new Vauxhall models. “Picture yourself on a long, lonely segment of highway,” said the research material distributed to GM personnel only. “It’s a rainy night, and you’re trying to stretch your gasoline to the next service station. GM promised motorists that DAIR could avoid such situations, but while the company’s ambitions must be applauded, it never really stood a chance. Just imagine how much investment would have been required to provide the necessary infrastructure. It was left to the Japanese to accelerate the growth in development. The brilliantly named Electro Gyrocator was launched as an optional extra in the Honda Accord in 1981, and is widely accepted to be the world’s first commercially available in-car navigation system. 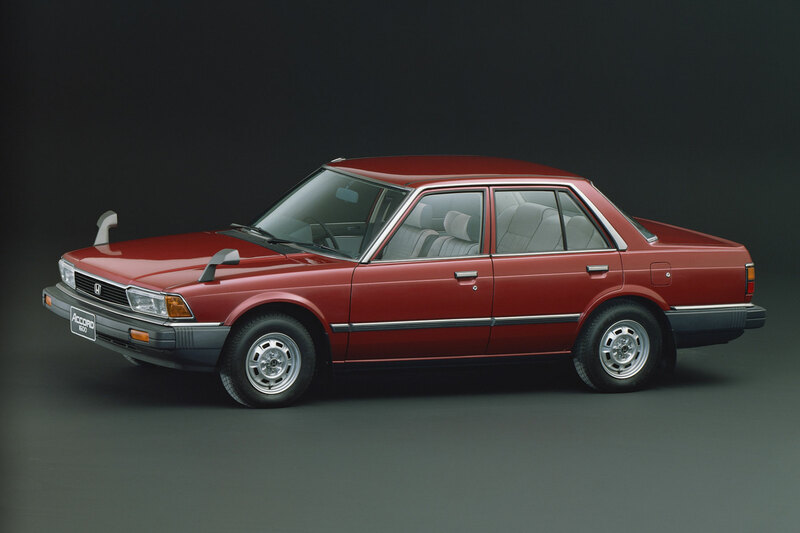 Nine years later, the tech-laden Mazda Eunos Cosmo became the first car to be fitted with a built-in GPS-based navigation system, with Toyota another early pioneer of navigation systems. The availability of GPS (global positioning by satellite) was the real turning point for in-car navigation. The technology was developed by the United States in the 1950s, with President Reagan making it available for civilian use in the 1980s. Meanwhile, from a spare bedroom in Surrey, NextBase created the AutoRoute journey planner: a complete digital road map of Britain. For the first time, motorists had an alternative to the humble road atlas. In the early days, in-car sat navs were the preserve of flagship motors, such as the BMW 7 Series, Mercedes-Benz S-Class and the Renault Safrane, which featured Carminat in 1995: a European CD-based system featuring a colour interface and 2D map not too dissimilar to the systems of today. Today’s systems are far more advanced. The Rolls-Royce Wraith, for example, uses GPS to select the right gear for an approaching corner. Meanwhile, Audi’s adaptive cruise control works with the navigation to select the appropriate pace for corners, junctions and speed limits. After the turn of the millennium, the in-car navigation system came into its own. No longer the preserve of luxobarges, the availability of sat nav filtered down to humble superminis and city cars. There was a cost, of course, but there was also a choice. The likes of Garmin, TomTom and Navigon flooded the market with aftermarket devices, the majority of which were considerably cheaper than the OEM systems. A manufacturer might have offered a system for a four-figure sum, while an aftermarket sat nav could cost a couple of hundred pounds. For years, experts warned against splashing the cash on an expensive OEM system, arguing that it would be obsolete in a few years and you’ve never be able to recoup the cost when it came to resale. Today, the lines are a little more blurred. Many motorists buy a car via a PCP deal, meaning the issue of obsolescence is no longer an issue. Equally, the growth of smartphone connectivity has meant that motorists already have the maps and apps required before they buy a new car. 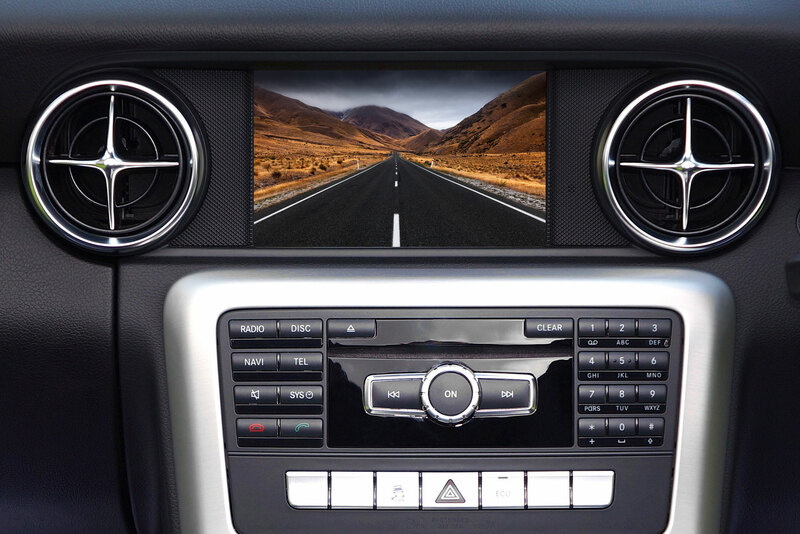 Does this mean the end of the aftermarket sat nav system? Garmin doesn’t think so, which is why we were sent a DriveSmart 50 to review. Truth be told, it’s been a while since we used an aftermarket sat nav. The majority of test cars are loaded up with gadgets, while we tend to rely on traditional maps when driving our own cars (for the true retro experience). 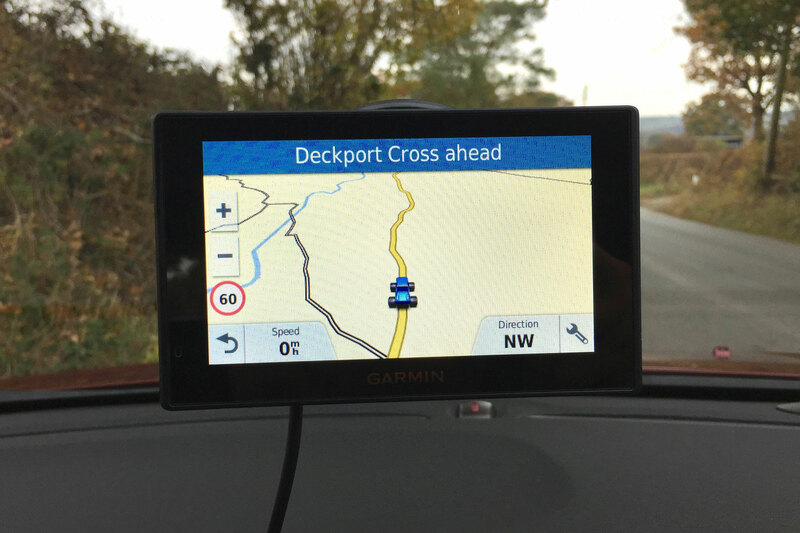 Garmin unveiled its latest range of sat nav systems at the Consumer Electronics Show in January 2016, with the DriveSmart sitting just above the entry-level Garmin Drive. The DriveSmart is aimed squarely at the smartphone generation, featuring customisable smart notifications that allow drivers to display calls, text messages and app notifications on the navigation screen. Press the appropriate button on the screen and the Garmin lady will read your text, email or social update to you and anybody else travelling in the car. It’s a little like Apple CarPlay in this respect, although there’s no option to voice a reply to a text. Other advantages of the DriveSmart over the basic Drive are the availability of a voice-activated navigation, Bluetooth for hands-free calling and real-time access to traffic and weather reports via a Smartphone Link app. The 50 in DriveSmart 50 refers to the size of the screen – in this case five inches. If size matters and you fancy something a little larger, the DriveSmart is also available with six-inch (60) and seven-inch screen (70). 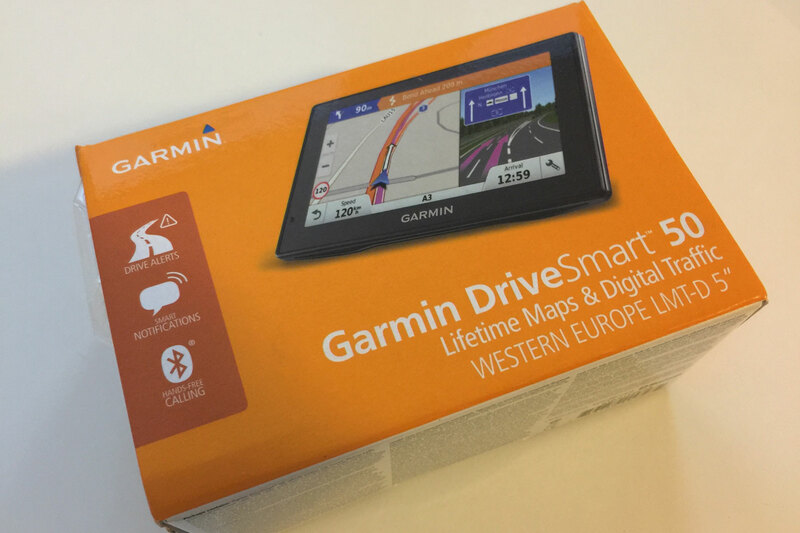 Garmin DriveSmart 50: what’s in the box? In the box you’ll find the obligatory suction mount, 12v socket to mini USB charging cable, USB to mini USB charging cable and a few leaflets. There’s no manual, so you’ll have to find this online. 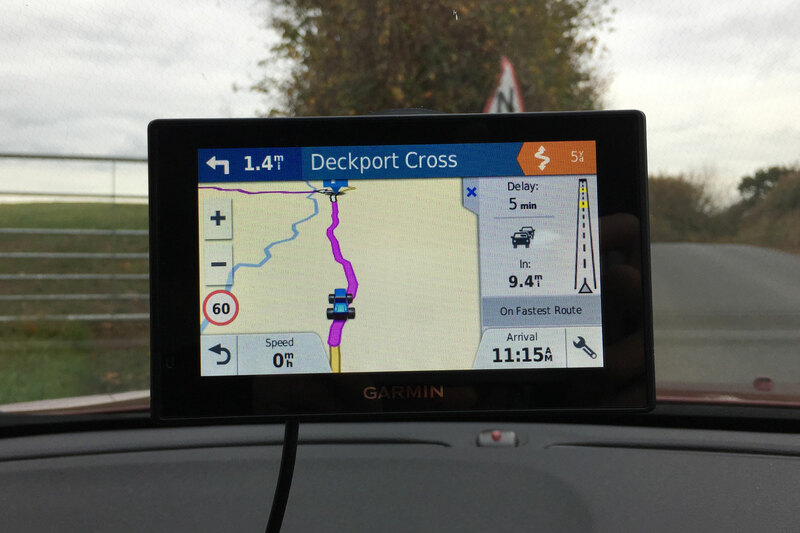 Be warned: although the DriveSmart 50 will operate straight from the box, you’ll need to download Garmin Express via the internet to take advantage of its features, not to mention the most current software. There’s no clear instruction to tell you this, just a diagram hinting that this might be the case. 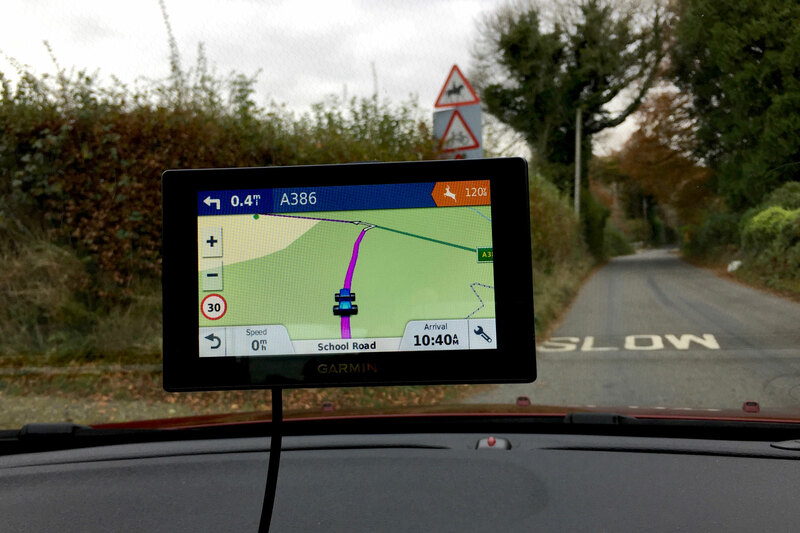 Using a 60mb broadband connection and an iMac, it look less than an hour to install the required software and update the maps, but it’s worth bearing this in mind if you’re intending to use the sat nav before a long trip or a holiday. Update it first! There’s a bewildering array of options to scroll through, including the vehicle icon to show on the map, driving map view, map detail, layers and audible driving alerts. But once you’ve established your ideal settings, you’re unlikely to feel the need to change them again. The audible driving alerts are a bit of a mixed blessing. On the one hand it’s good to be alerted to schools, animal crossing points, speed limits and bends, but it can also be incredibly annoying. After three ‘bongs’ alerting you to various bends ahead, you will be reaching for the off button. Fortunately you can pick and choose the alerts you want. Our guess is that the majority of drivers will remove them all. They’re not exactly consistent, either. On the rural roads of Dartmoor, we were warned about animal crossing points a number of times, but not once did it alert us about a school. Some consistency is required. On the plus side, the voice control system is very good. Even with Ken Bruce chattering away in the background, the Garmin was able to recognise our commands and reacted accordingly. Again, you’ll need to spend a few minutes to set things up, but the reward is a reliable and intuitive system. As you’d expect from Garmin, the maps and route guidance are very good. It’s easy to get carried away with the array of apps and smartphone integration, but the primary role of the DriveSmart 50 is to get you from A to B with the least amount of hassle. Inputting a town or postcode is easy, not least because it features predictive text, while the voice control allows you to make changes on the move. A neat touch, and something you don’t often find on OEM systems, is its ability to provide street names as part of the instructions. In other words, while the OEM system we tested alongside the Garmin simply told us to turn right, the DriveSmart instructed us to ‘turn right onto Rose Cottages’. Makes things a bit easier, especially in a built-up area. It’s not perfect. On a few occasions, the estimated time of arrival was a little pessimistic, saying we’d arrive at our destination a full 10 minutes later than the actual ETA. Not a problem on a four-hour journey, but not great when the journey only took 25 minutes. It also warned us about traffic delays that simply weren’t there. In fairness to Garmin, this problem tends to affect other systems, but it might result in a few needless diversions. The screen itself is clear, if a little prone to reflections, while the maps are easy to use. Zooming and panning is simple thanks to ‘pinch and zoom’, although this can lead to a few smeary marks on the screen. In fact, an aftermarket sat nav probably isn’t the best choice if you’re not a fan of clutter or mess. With the Garmin attached to the windscreen, you’ll need to find a safe home for the trailing charging cable, while the suction mount will leave a circular mark on the glass when removed. Being picky, we’d also like some kind of pouch or sleeve to keep the sat nav safe when not in use. We’re forever being told to remove sat navs from our cars when parked up, so some kind of protection would be handy. 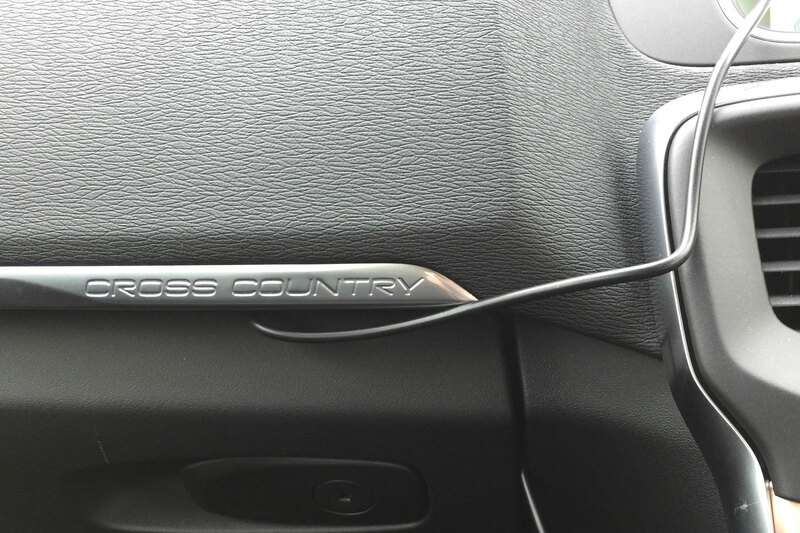 Other gripes – which aren’t isolated to the DriveSmart 50 – include the fact that, unlike OEM systems, the volume of the stereo isn’t lowered when commands are being read out. Furthermore, the commands sound a little ‘tinny’ compared to the OEM sat navs which have the advantage of using the car’s speakers. But with prices starting from under £150, it’s hard to argue with the Garmin DriveSmart 50. Our system is the more expensive 50LMT-D, which features lifetime map and traffic updates, along with UK, Ireland and Western Europe maps, and costs £189.99. The OCD in us would prefer the simplicity and uncluttered convenience of an OEM navigation system, but when even the Media Nav Evolution on a Dacia Sandero costs £300, it’s easy to see the appeal of an aftermarket system. Besides, the DriveSmart is as smart as the name suggests, with an ability to look at previous journeys to inform you if there are any expected delays on your daily commute. Features such as this will encourage you to continue using the system, rather than leaving it in the glovebox. Equally, the free traffic and map updates for life will keep the DriveSmart current, long after after sat nav units have been condemned to that drawer containing all the other gadgets you’ll never use again. One final point: for us, the jury is out on the whole notifications thing. While we can see the attraction of having texts, emails and social updates read out on the move, isn’t it just another distraction for drivers? What’s more, without the ability to voice command a reply, isn’t there a temptation for drivers to pick up their smartphones and respond in real-time? At least with Apple CarPlay you can reply to a text message without touching your phone. Thanks to Halfords for the loan of the Garmin DriveSmart.